Rospaks! To many old style tabletop wargamers interested in historical scenarios Rospaks says it all. 'These are some of the best figures ever made' is what many say, and indeed the Rospaks line consists of very beautiful figures. But the sad story is that Rospaks only produced between December 1981 and October 1982; their kingdom only lasted for 11 months, and their fans are still in mourning! Rospaks was produced by the white metal figure firm of Heroics and Ros. It was an experiment in 25mm hard plastic scale. A package of 20 infantry figures or 12 cavalry soldiers only cost 99p (GBP), which was cheaper than metal. The first set was thus introduced in 1981 and the last in 1982. The line was discontinued because of economical reasons, they say. 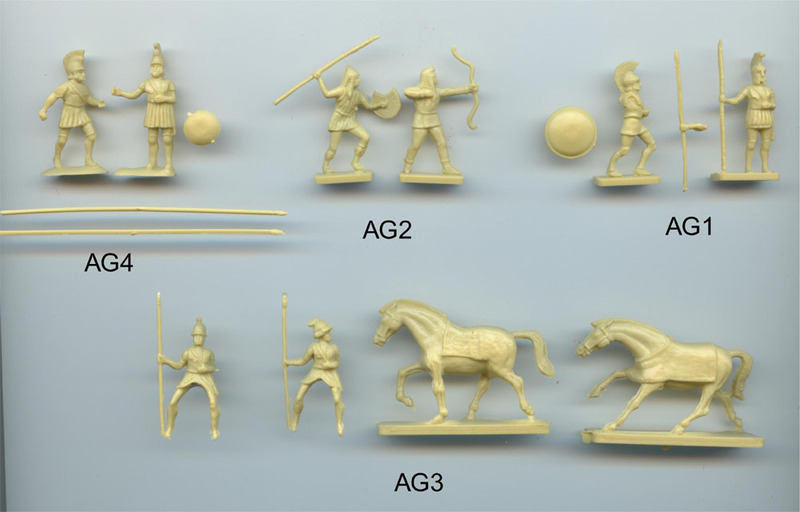 Besides the figures they also produced decals (waterslide transfers) as shield designs for their Greek City Hoplite (set nr T1), Romans (T2) and Macedonian (T3). A very unique offer and never repeated by any manufacturer since then, as far as I know. There were also painting Instructions for sale: Sheet A for packs AG1 - AG3 and Sheet B for packs AR1 - AR3! Check out this website to download them! And there was even a rule book 'Warfare in the ancient World'. A very complete offer so to say. The figures were sold in header-carded polybags. They mostly came with separate shield, arms and spears to make various poses. Something we see more and more in the last years with present manufacturers as well. The Greek thus came in 4 sets with 8 poses in total. AG4 is very difficult to find, certainly in a complete bag. It was even long thought that they were never made. Probably they were issued in small quantities only. 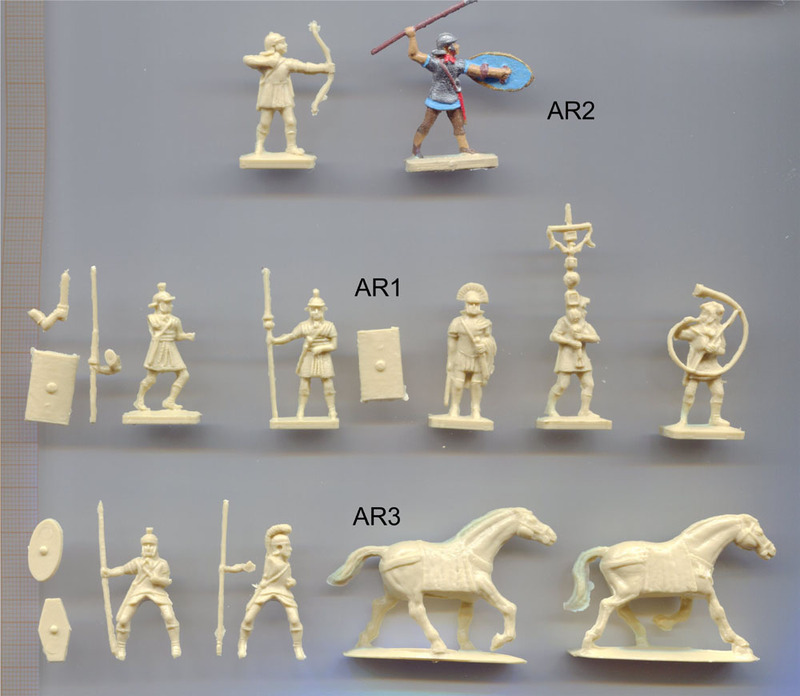 With AR1: the first two in the row are the infantry poses, the 3 others the command section. These are hard to find in one piece (they are often damaged because of the hard plastic). Persians; AP1 - Persian Archers Kneeling Firing and AP2 - Persian Spearmen (Kardakes). But I never came across them. They were probably never released. Geoff Cooldrey, 'Rospaks where are they now?' In One Inch Warrior nr 4. Hugh Walters’ Small Scale World; various posts. 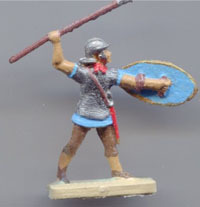 Will's Wargames Blog, with nice painted Rospaks armies. Vintage wargaming article. Where you can download the painting instructions and a decal sheet!